Southern Africa is facing a large number of climate risks as a result of increased extreme weather events, which in combination with low levels of adaptive capacity, makes this part of the continent highly vulnerable to the impacts of climate change. An example of this are the impacts from the 2015 drought, which resulted in severe water rationing in Gaborone, Botswana, hydropower plants closing in Tanzania and power production being reduced from the Zambezi. A contributing factor for lower levels of adaptive capacity is a massive infrastructure investment backlog, particularly in rural areas. Climate resilient water infrastructure that is in harmony with ecosystem requirements is therefore critical to enhance development. To this end, there have been a number of tools and approaches developed and undertaken to integrate climate resilience into the planning, design and implementation of water infrastructure projects. CRIDF, together with the Permanent Okavango River Basin Water Commission (OKACOM) and the Climate and Development Knowledge Network, convened a session at World Water Week to share learning on the approaches and tools that have been used in different contexts. The session participants ranged from national level government officials to researchers working on water governance issues. The CRIDF tools presented (climate resilient development pathways [CRDP] and the vulnerability assessment tool) were found to be useful by a number of participants, who wanted to start using them immediately. Within other contexts, there were suggestions that the vulnerability assessment tool would need to include the probability of certain risks occurring as well as options for addressing higher risks. So what have we learnt about integrating climate resilience into water infrastructure from a policy makers perspective? Critical success factors for resilient water infrastructure include involving the right stakeholders at the right time. This requires an understanding of the political economy that decisions are made in to ensure that there is adequate and sustainable buy-in for integrating climate resilience. In addition, identifying the right type of champion for the planning, design and implementation phases contributes to the overall success of integration. What have we learnt from a financing perspective? More needs to be done to engage financiers during the planning and design of projects to not only ensure that financiers understand the project, but also so that it fits the scope of what they are able to finance. Were there any changes in perception as a result of the session? Using Mentimeter to gauge the different perceptions at the start and end of the session, there was a clear change in participants’ perception of when climate change considerations should be integrated into the project cycle. 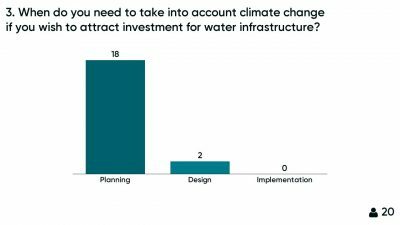 At the start of the session, the majority of participants felt that climate change should be integrated at all stages of the project cycle (planning, design and implementation), as shown below. 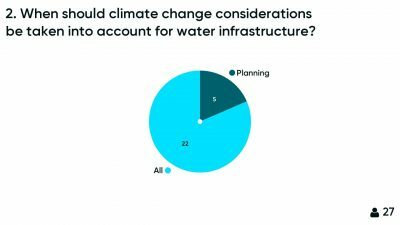 At the end of the session, the majority of the participants felt that climate change considerations should be included during the planning stage. In summary, the session provided a space for CRIDF to gain feedback on the tools, particularly with regard to where they could be further enhanced. Participants acknowledged that improved transboundary basin management was critical for improving the climate resilience of the poor and that climate change considerations are important to attracting finance for water infrastructure.